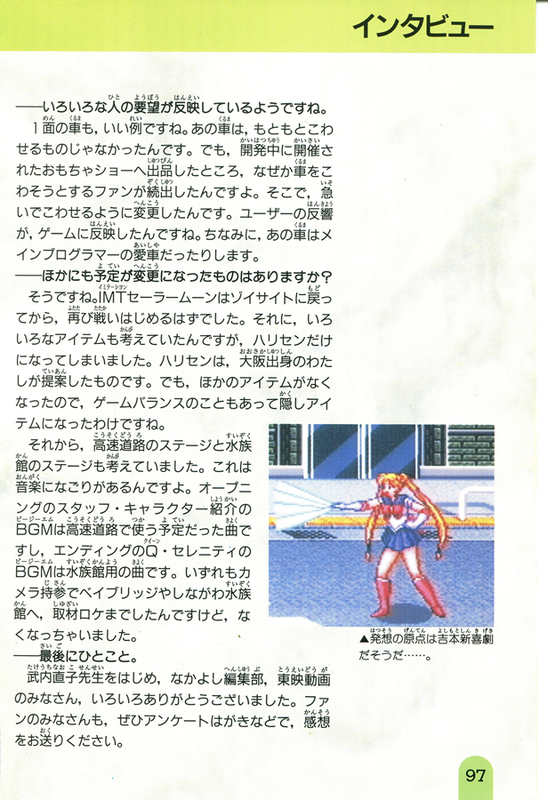 Representative works: “Oda Nobunaga” for the SFC and “Sailor Moon” for the GB. 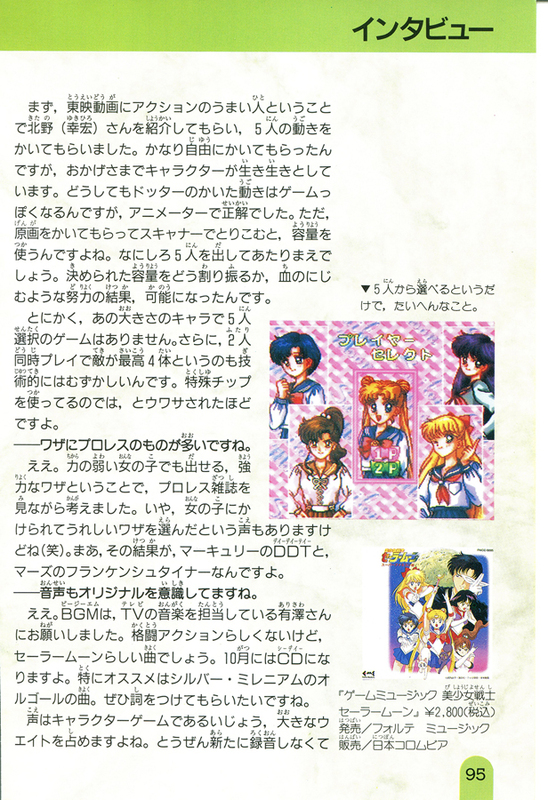 — First off, please tell us about how you came to develop a Sailor Moon game for the Super Famicom. Well, we just released the Game Boy game in December the year before, and it pretty much sold out throughout Japan. 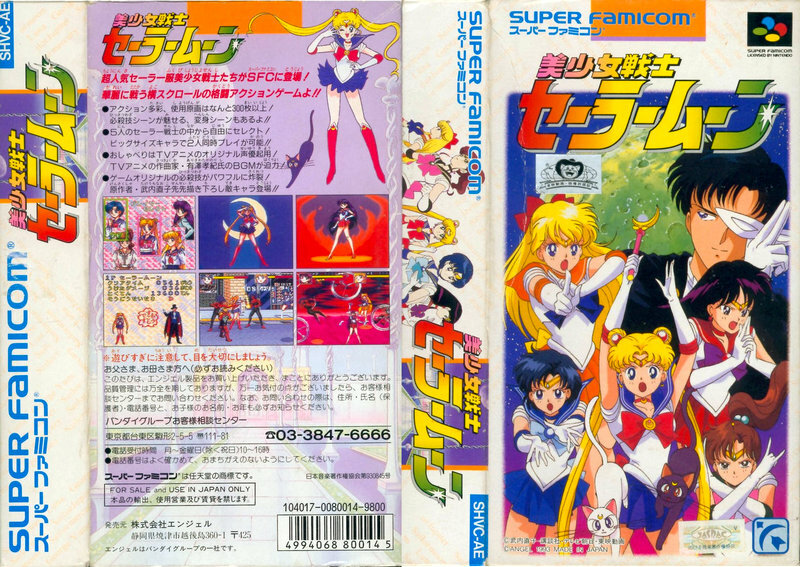 However, there are a lot of restrictions due to the Game Boy’s hardware, so we felt that we would like to release a Sailor Moon game for the Super Famicom as well, since it has less restrictions than the Game Boy. The Game Boy game being such a hit is what brought this about. 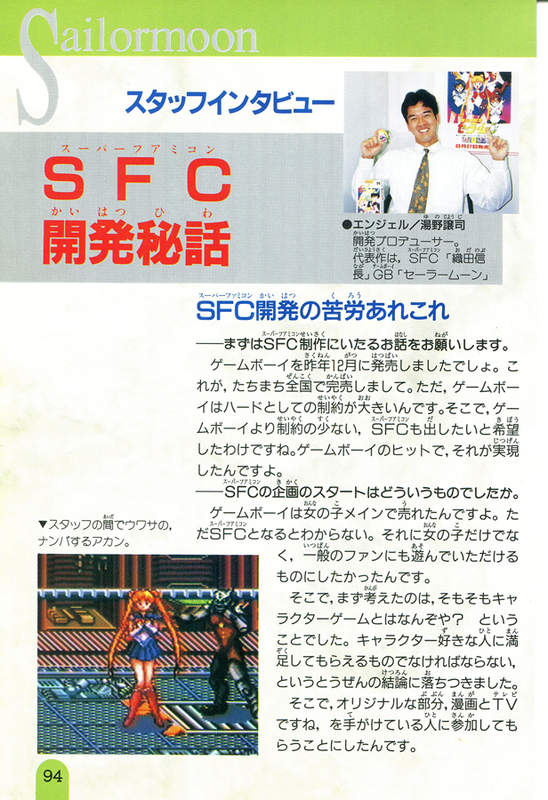 — What was the start of planning for the Super Famicom game like? The Game Boy game was sold with a primary focus on young girls, but with the Super Famicom, we just didn’t know. We really wanted to have a game which would be enjoyed by all sorts of fans, and not just young girls. That’s why we started off by thinking “what is a character-based game, actually?” and came to the obvious conclusion that it needed to be something which would meet the needs of those who loved the characters, leading us to the decision of having those involved in the original work (i.e., he manga and TV series) be involved here as well. At first, I was introduced to Mr. (Yukihiro) Kitano at Toei Animation, who is great with action scenes, and had him draw the movements of the five characters. I left it to him as to how to draw them and he really brought the characters to life. No matter what you do with it, movement drawn by a pixel artist will have a game-y feel to it, so it was the right choice to bring an animator in. Unfortunately, after we scanned in the work he drew for us, it took up a lot of memory. But still, we need all five of the senshi, you know? After we put our all into it, we were able to fit them in. Up until then, there were no other games where you could choose five characters of that size. What’s more, it’s technically difficult to fit in up to four enemies at once in the two-player cooperative mode. There was even a rumor that we were using a unique chipset! — It looks like you used a lot of pro-wrestling moves for the special techniques. — I notice the music is also original. Correct, we asked Mr. Arisawa, the music director of the TV series, to do the BGM. It doesn’t seem to fit fighting action, but they feel like Sailor Moon songs. There will be a CD out in October, and I really recommend the Silver Millennium music box track. I’d love for there to be lyrics put to it! Since it’s a character-based game, the voices took up a great deal of space. We obviously had to newly record a lot of audio, so we had to voice actresses come together during a break in their busy schedule. This was right after Ms. Mitsuishi came back to work. 3 Even here, we didn’t give really detailed instructions to the voice actresses. We thought that the voices from the characters could come out naturally that way. The staff asked that Mercury’s “ei”4 sounded more helpless, which the actress kindly did for us. The staff and cast really came together here, so I think they can meet the fans’ high demands. However, voice samples use up a lot of space, you know. Especially women’s high-pitched voices, which take even more than men’s voices. Also, there are limits on the hardware when speaking is enabled. That’s why the names of the techniques are spoken quickly and when playing two players cooperatively, special techniques pressed at the same time aren’t spoken. — These are illustrations by Kazuko Tadano, right? Right, she did the package and character select, the post-transformation poses, and the ending. By the way, she also prepared pajamas and swimsuits for the eye catch,5 but they couldn’t be put in due to the amount of data consumed. Mr. Osano, of the Nakayoshi editorial department, was the one who had recommended to us to have Ms. Tadano do the art. 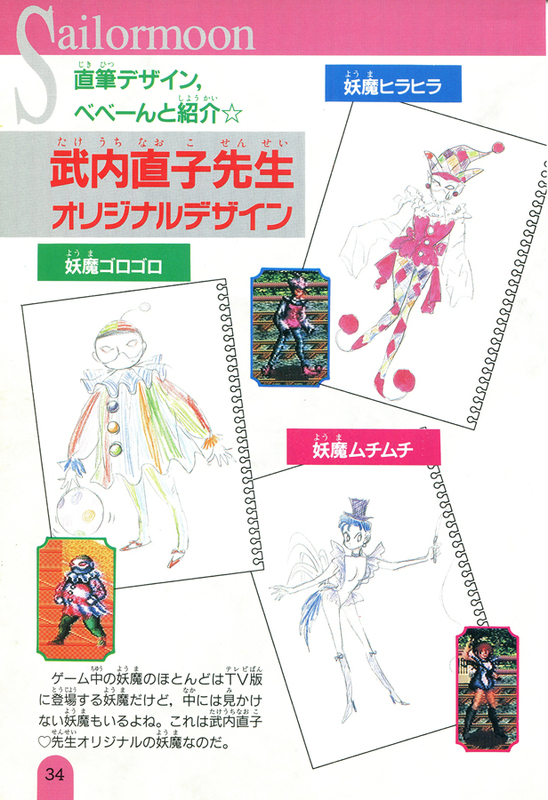 Having Ms. Takeuchi make original youma was also his idea. 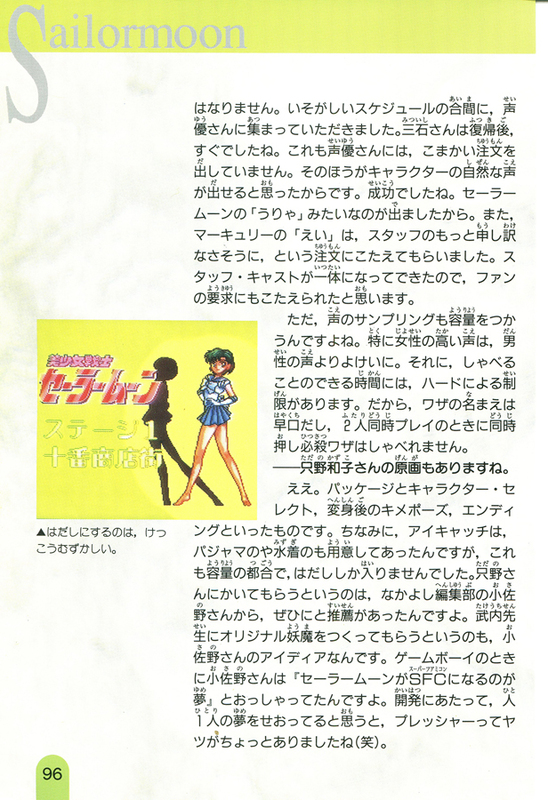 While making the Game Boy game, Mr. Osano had mentioned that “it’s [his] dream to see Sailor Moon on the Super Famicom.” Just thinking that our development was getting closer to realizing someone’s dream put a little pressure on me (laugh). — It sounds like there are a variety of demands from different people in this game. The car in Stage 1 is a good example. In the beginning, the car was non-destructible, but when the game was shown off at a game show during its development, for some reason one after another fans kept trying to destroy the car, so in a rush we made it destructible. The reactions of the users were reflected in the game. By the way, that car is the main programmer’s favorite model. — Is there anything else that changed from the original plan? 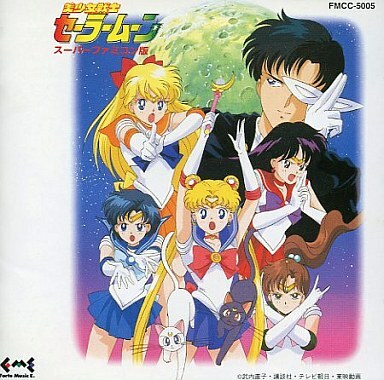 Well, the fight was supposed to begin anew right after IMT Sailor Moon6 changed back into Zoicite. Also, we were thinking of a lot of items, but ultimately it ended up being only a harisen,7 which I recommended, since I’m from Osaka.8 However, since there were no other items, it became a hidden item for the sake of game balance. Other than that, we also considered a highway stage and an aquarium stage. Traces of these remain in the music. The BGM for the opening staff credits and the character intro was the song planned to be used for the highway and the BGM for Queen Serenity in the ending was the song for the aquarium. We went out to the Bay Bridge and Shinagawa Aquarium with cameras in hand to do on-location research for both of them, but they were cut. — Any last words to share? I would like to thank Ms. Takeuchi of course, as well as everyone from the Nakayoshi editorial department and Toei animation. And to the fans, please fill out your thoughts in the survey and send them to us. ← Why Are Sailor Moon’s Titles Almost All the Same Length?